December 1563: England is a troubled nation. Catholic plots against the young Queen Elizabeth have left the country in a state of fear and suspicion. Late one night, the respected herald William Harley, known to all as Clarenceux King of Arms, receives an unexpected visitor. It is his fellow Catholic, Henry Machyn. Machyn is desperate for Clarenceux to hide a manuscript he possesses. It soon becomes apparent that it contains a secret so dangerous, their lives are at stake. Not long afterwards, Clarenceux is visited by the State in the form of Francis Walsingham and his ruthless enforcer, Richard Crackenthorpe. His peaceful life is immediately shattered. If he and his family are to survive the violence of Walsingham’s pursuit, he must untangle the meaning hidden in the chronicle. On the run, and with the aid of Machyn’s wife Rebecca, Clarenceux is chased through underground chambers and city streets as he struggles to solve the clues in the chronicle. Yet the more light they shed on the mystery, the more terror overtakes their world. Beaten, tortured, and hunted-down, they realise that what they have in their possession could tear the whole country apart. 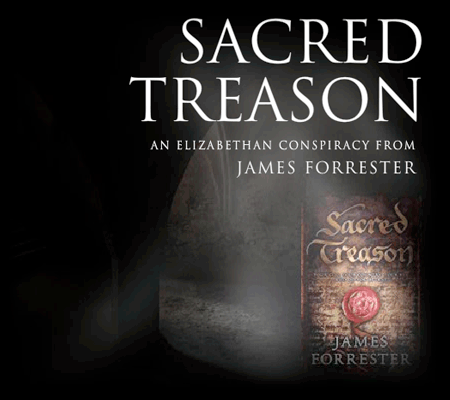 Bringing to life the sights, sounds, thoughts and fears of sixteenth-century London, SACRED TREASON tells a thrilling story of murder, betrayal and loyalty - and the power of the written word.